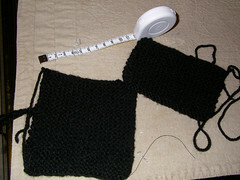 The larger swatch in the bottom left is about 10cm by 10cm, as measured, and knitted. The other is purled 22 by 30, both with UK size 8 needles, which the tension guide on the yarn seemed to imply would produce a 10x10cm square. It did not, but I'm still proud of the swatches, and obviously am learning the importance of doing tension swatches fist. - to keep the stitches as loose as possible. Needle size and yarn dictate size of stitch, not me pulling it super tight. - that row counters rock. - that is all else fails, you can start again no problem. I kinda like this knitting milarkey. Now I will attempt a similar swatch in stocking stitch before I am ready to start a project. If only you were close enough for me to gift the new knitter with some yarn! My Big Box of needles inherited from my grandmother includes not just a collection of DPNs but also a 16" circular needle. I think one of my first projects will be with DPNs, unless I decide following a coloured chart is easier for a first project. I do need a knitting icon, though. That is the Proper and Sensible way to learn the craft. I leapt straight into a project that uses three different stitches. I frogged the first couple of rows at least ten times due to frak-ups. Row counting is a challenge I will deal with later. As I'm knitting a scarf I'll stop when it looks long enough. Or maybe when I run out of yarn. It is the way I'm learning because that's the only wool I have! Also it gives me something to do while I'm figuring out what I need for the projects I want to do. I wanted to use really fabulous yarn for my first project so I would enjoy it and not be put off knitting by horrible, cheapo, scratchy rubbish. I went to a gorgeous wee knitting boutiqe and essentially said, "I'd like to learn to knit. Yarn me!" This was, ah, an expensive decision. But worth it, I think! Mmmmhmmm. The yarn size and needle size are the two big factors in how big your knitting turns out, but everyone's hands are different. Not right or wrong, just different. F'rinstance, I'm a very aggressive knitter. I snap plastic needles and bend metal and wooden ones. Other people aren't so much. Yay! You made knittings! Welcome to a wonderful and slightly (incredibly) addictive world! I was wondering if I was using the wrong needles, but I don't think I was. Oh well, I can now learn to interpret my tension swatches. Tension was the problem I had when I learnt to knit 20-odd years ago. I found it so difficult as I would take such care over every stitch to ensure that it was the same size as the previous one, that it took me all day to do a few rows. And then it would all come out variable anyway! I think my mother's hopes of me becoming another Kaffe Fassett ended there. I don't do that. I have enough practice now to be able to set my fingers to 'auto' and worry about everything when I have a row. When can I see you this week? I have no plans for this evening; if I'm not going climbing tomorrow then I will hopefully be at the British Library café from 17:30 to 19:30, doing a spot of Nano-ing; I'm not fencing this Thursday as the leisure centre is setting up for the Beer Festival, so may be free then, unless I go to Jim's choir concert, and I have no plans for Friday. It's all scribble-scribble this month. I am leaving Thursday, so if not tonight, I'm thinking tomorrow or Wednesday. Wednesday I have my choir rehearsal 'til gone 21:00 so that's probably no good to you, since Sadclub hitched up its skirts and ran screaming into Thursday, so either tonight or tomorrow - whatever fits in the best with your plans. You're making me make decisions? Look, it's either you or me. And I'm bigger, older, meaner and nastier. But you're not just a pretty face, so come on, pick a time, choose your weapon, etc. This page was loaded Apr 22nd 2019, 10:49 am GMT.